This episode is fantastic. THIS is how I wanted Steins;Gate to end. One of my only complaints with the original series is how they had to have episode 24 and how it felt like they undermined the tragedy in the story to give everyone a happy ending. To me, it was like the creators were afraid of leaving it as a tragedy for fear the fans wouldn't like Kurisu actually dying as if to discard the entire point of the series itself: The choice. Who do you choose to let die? Your childhood friend who has become part of your identity? Or the only girl you've loved? I honestly enjoyed the throwback with the art and animation. I appreciate that they didn't update the look and instead it felt like a alternate version rather than an addition. I understand completely that Steins;Gate 0 will look relatively different (it'll be 1080p, have the look of the VN, and will obviously be better funded) and I have no problem with that, but it was really nice that they stuck with what they did in the original series in this one. I thought that the mini-development Okabe went through in this episode is terrific. Obviously having previous knowledge about his character helped our foundation, but we could see before our eyes him mentally snapping. He just crumbled. With this crumbling, he matured. We could see at the end how Okabe is now a college student, he's accepting adult responsibilities, dressing in a more conventionally appropriate way, and he even remarked that he's socializing. I could be wrong, but the phone call Okabe had sounded like he was either going on a date, or meeting up with some friends to eat or go to a movie. This is something the Okabe of the original series wouldn't have done. His development is masterfully portrayed. After watching this episode I am even more excited about Steins;Gate 0 than I already was, and that's all a special really is, isn't it? A way of putting out something for people to see and get excited about. This is a wonderful "prequel" episode to the events that are about to unfold and I, personally, can't wait to see what comes next. Thank you for reading my review, and as always, feel free to leave a reply on my profile if you liked or hated it and need to tell me why. Either is fine, I don't mind. Steins;Gate episode 23 β is an episode that was aired on NicoNico when the countdown for newest visual novel from the Steins;Gate series, Steins;Gate 0 ended, which was on December 3rd, logically every S;G fan began to get hyped and anxious about this new episode. This alternate episode starts off just like the regular episode 23. (Only about 7 minutes towards the end are different) Oh, you don't remember what was going on in the episode 23? Here's a quick reminder! Steins;Gate (regular) episode 23 title is "Open the Steins Gate" and it beings with Suzuha explaining that Okabe MUST save Kurisu and avoid World War III, and enter the world line known as Steins;Gate, these two time-travel together to the past, most precisely to the building from episode 1 where everything started, and Okabe hides in the room where Kurisu was stabbed. 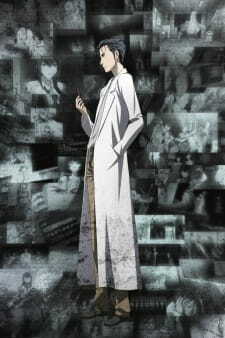 Kurisu's father, Dr. Nakabachi meets Kurisu in this room and goes berserk on her trying to kill her, Okabe tries to save her... only to kill her herself, oh how cruel is the fate that the mad scientist must go through to save his loved ones. When Okabe returns to the present accompained by Suzuha, he keeps muttering "I killed her..." in a very despair-inducing tone while refusing Suzuha's attempts to return to the past a second time and save Kurisu. While he is on such as traumatic state, Mayushii slaps him and gives him a pep talk insisting that he should never give up, followed by Suzuha telling him that he should have failed saving her... that it would unlock the video message that was unwatchable the day Kurisu died, which contained his future self telling him how to achieve Steins;Gate. But on the alternate episode... Suzuha tries to slap Okabe so he will try the second attempt, but is stopped by Mayushii, who proceeds to comfort the devastated blood-stained Okabe, hugging him while he cries. This scene ends and we Okabe lying on the lab couch, with his lab outfit thrown on the ground... in a chill inducing epic post traumatic stress disorder scene hearing some words over and over and over. Shortly after, there's another scene transition where Okabe (damn he looks good in black) meets Mayushii in a park, they walk around for a while while talking, but as we get to know from their conversation, Okabe doesn't go to the lab anymore, meaning he dropped his mad scientist persona. Okabe then has a monologue "Mayuri is safely here with us. Not this town... Not myself... Nothing at all... has changed." which is followed by the ending music, which completely gave me flashbacks from episode 9 and a complete chill on my spine. After the ending ends, we see Kurisu... on what appears to be a TV, and Okabe looking at it dumbfounded hearing voices in his head, and accepting the fact that fate is converging yet again. I personally can't wait for the wild ride that Steins;Gate 0 is gonna be, and this alternate episode is the hype generator for it! The art seems the same as the original S;G which I'm all up for it, since I enjoyed it a lot, the soundtrack is ever-so great along with the voice acting (Mamoru Miyano as Okabe is so freaking good that I can't never have enough), and the plot had a magnificent introduction here. As I finish my review I'll leave these final words. Review in brief: White Fox, wanting to show the world that Steins;Gate 0 would be adapted into anime, decided to go the extra mile and made this alternate version of Steins;Gate episode 23. While this special was carefully made to blend in with the original episode and give a subtle peak at what’s to come, it forgets one very important thing: to properly cement itself as an ending of Steins;Gate. Review in full: I've always felt that episode 23 was one of Steins;Gate's best episodes. Re-visiting the events of episode 1 and revealing just how much was actually going on gave credence to the sudden turn of events at the end of episode 22, and Okabe mustering the strength to try one last time to set things right despite all that he had been through was one of his defining moments. Heck, what Okabe ended up having to do by the end of it to succeed was one of the defining moments of the entire show. The reason I consider Steins;Gate to have a good ending, or even an acceptable ending, is because of how episode 23 played out. Of course, the reason this alternate version of episode 23 exists is to show where the path splits to allow Steins;Gate 0 to happen. It certainly looks and feels like it came straight out of the original show despite being made four years later, and considering the original's quality it's impressive that way. What’s on display here cements it as being just as much a part of this Steins;Gate as it is a part of Steins;Gate 0. For that same reason it's somewhat understandable for it to reuse 2/3rds of the original episode 23, but it doesn't leave itself much time to show the difference. Maintaining the old episode until the path splits gives it authenticity, but it should have allowed itself to be longer than a standard episode to fully explore its alternate direction because it leaves a few gaps in its wake. It ends up feeling like a partial showing, one that was meant to create confusion rather than provide resolution, and considering the time skip it contains there’s little chance that Steins;Gate 0 will clear things up. We get to see what Okabe becomes as a result of this alternate experience, which is important in its own right and got the attention it needed, but without a smooth transition it ends up looking like Okabe suddenly wiped his memory to alter his habits instead of consciously changing himself as life continued around him. It doesn’t feel right, and with no indication that he intends to revert him back to the way he was it doesn’t feel intentional either. Fate might have other plans for him of course, especially with how this special ends (or rather teases the beginning of what’s to come) but the unnatural presentation of Okabe’s self-change still left a sour aftertaste. Verdict: I can appreciate this special for how it bridges Steins;Gate to the new story to come but I’m not pleased with the one-way nature of it. By lacking the story detail needed to provide proper closure it fails to be the keystone that the original episode 23 was to Steins;Gate. It works well as Steins;Gate 0 episode 0 but it’s not a proper ending to Steins;Gate despite containing the plot and production values to have managed it with the proper direction & length. By both showing Okabe try to leave this special’s events and not showing what led him to that course of action, episode 23 β forgets some of the elements it needed to be cohesive and comprehensive, even if the rest is well-presented. This Steins;Gate alternate episode cuts into the main series and changes the story completely to make it possible to have Steins;Gate 0. It's hard to rate or review something that is simply another episode of a series. It's not like the sequel special (Steins;Gate: Oukoubakko no Poriomania) where that has a beginning, middle and end. It's just a convenient replacement for episode 23. I don't know if to rate it the same as the main series, or try to dissect it as a stand alone. It fits perfectly, picks up just fine, and feels very natural to the main series; but, it doesn't do anything in itself other than undo the original ending. By itself, it's not better or worse than the original episode 23.